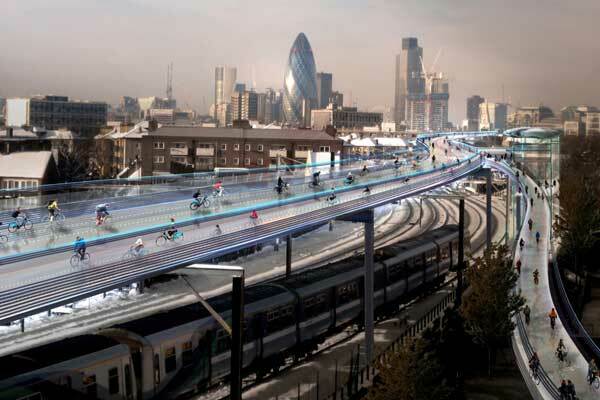 Well-known British architect Norman Foster has recently unveiled a potentially revolutionary concept for the future of cycling in London, under the name of ‘SkyCycle’. The idea has been presented in partnership with Exterior Architecture and Space Syntax, and involves building elevated routes for cyclists above existing railway lines. Proposals for the SkyCycle network have outlined over 220 kilometres of car-free cycle routes, with over 200 entrance points, covering almost six million people in its catchment area. Each route is reported to accommodate 12,000 cyclists per hour, and expected to improve journey times by up to 29 minutes. “Cycling is one of my great passions,” says Lord Foster, who is also president of Britain’s National Byway Trust. “And I believe that cities where you can walk or cycle, rather than drive, are more congenial places to live. Over the past decade, cycling in the capital has grown by 70 per cent, and on major roads the number of cyclists has increased by 173 per cent. However, an increasing number of casualties unfortunately reflect this growth, as between 2006 and 2011 the number of fatalities rose by half, and eventually culminated in six deaths over 14 days during November 2013. “To improve the quality of life for all in London, and to encourage a new generation of cyclists, we have to make it safe,” Foster added. But does his elevated highway solution have legs?